At Northwest Closets & Wallbeds, Inc. we offer premium quality Wallbeds/Murphy beds using the finest spring mechanism technology and design taste to bring back that space that you need most. We offer many styles of beds from Shaker to Traditional or from Classic to simple plain. Even if you're in the market for something completely customized and unique to your home, we have the experience and capability to make it happen. 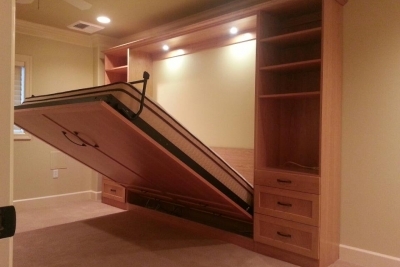 Whether it is a Wallbed/Murphy Bed Project, a Custom Home Office project or both! Rest assure that we can create for you a beautiful custom office that is not just appealing to the eye, but is functional in every regard. Allowing space for filing cabinets, drawers, storage cabinets and a sitting area while finishing it off with a custom laminate or granite countertop is what we do. Custom Cabinetry is not a far cry from our custom Wallbed/Murphy bed Cabinetry. Bringing the same quality cabinetry, custom staining and detail oriented construction and design; we offer services to those who are looking for custom entertainment centers & kitchens! With the emphasis on storage, we not only bring beautiful cabinetry and value to your home, we bring organization which is key to a less chaotic lifestyle that everyone can appreciate. It makes sense to us that the biggest room in your home should certainly hold the most "stuff". 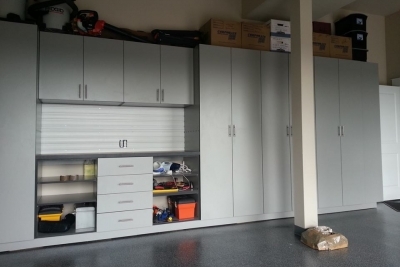 With Custom Garage Cabinets/Organization Systems you won't just be able to store all of your bulky items but also increase the value of your home and park your vehicles where they belong! With an Custom Garage Cabinets, no more will your garage be used as storage shed. Instead, it will for the first time be a focal point and inviting room to your home. We are pleased to have you as a visitor to our site. We hope that our descriptions and visuals will provide you with enough information to choose us for your next custom Wallbed / Murphy Bed or custom organization project. Murphy Beds / Wallbeds (or as some would call it, a "fold-away bed") is an amazing way to gain unused space. Many customers ask whether these wallbeds belong in small apartments or condos. Truth is, they go nicely in all home sizes from large to small. It really depends on the space allowed and the overall goal of the room. Most Murphy beds wind up making a room dual purpose while nmaximizing the space for your guests and storage needs. They are incredible space saving pieces of furniture and can be built modern or traditional in style. They are also very comfortable! Gone are the days of the steel bar across the back or uncomfortable custom style mattresses! Murphy beds are as comfortable as the mattress you put on them!. 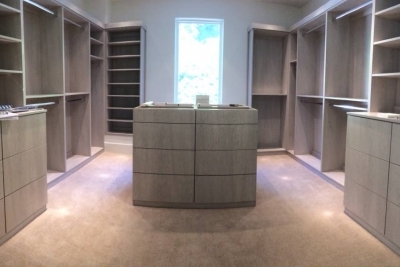 We're not just a Wallbed company...The ever-growing variety of products and services that you will find at Northwest Closets & Wallbeds are designed to provide as many custom storage solutions as possible in the home or office setting. As with many companies in this industry, we also offer innovative storage solutions for custom closets, garages, laundry rooms, home office-just about any space that needs to be organized. We are your Murphy bed cabinet and organization experts for the greater Seattle / Bellevue, Tacoma and Olympia area. If you have any questions that you do not find addressed on our website, feel free to contact us—we might just have an answer! Welcome again to Northwest Closets & Wallbeds.